democratic debate | Send Down the Basket! We know who represents Egypt. But who constitutes it? 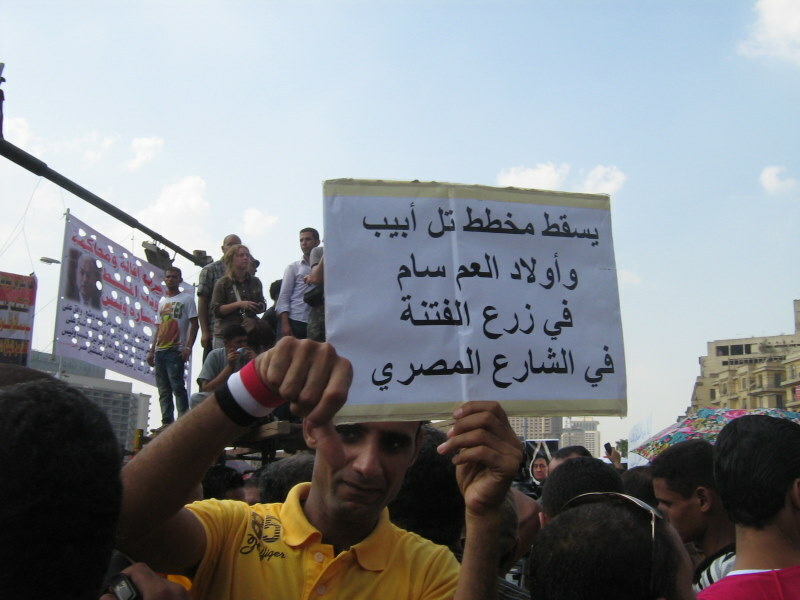 Neither the Brotherhood nor SCAF wants a system of checks and balances. Might that be exactly why they eventually produce one? 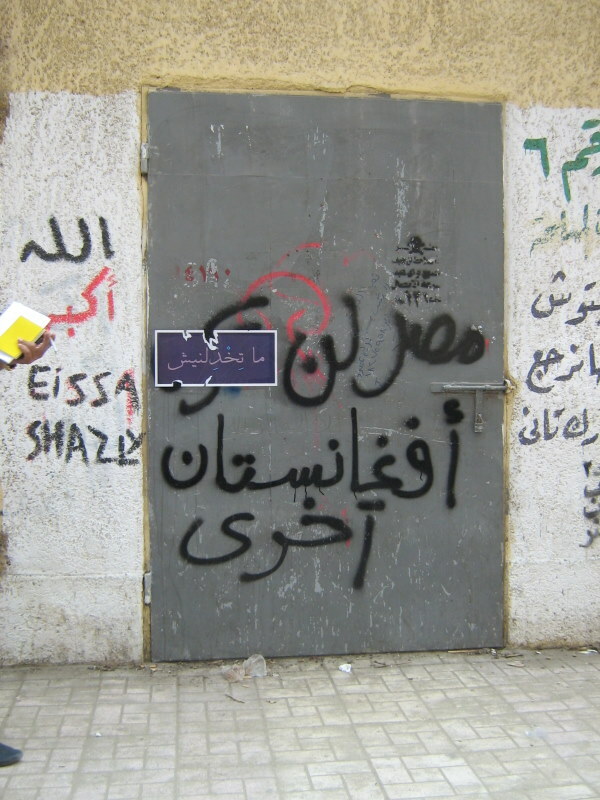 As before November 18, when the MB and Salafi parties very successfully challenged SCAF’s attempt to impose “supra-constitutional principles” ahead of the first-round parliamentary elections, the MB is standing up to SCAF on matters of legitimacy and power. Specifically, who gets to write the constitution? Will it be people named by the democratically elected parliament? If not, why? SCAF held a ridiculous (foreigners-only) press conference Wednesday claiming that the to-be-elected parliament does not “represent Egyptian society” and therefore asserting control over the process of naming the constitution-drafting committee. In response, the MB withdrew from SCAF’s “advisory council” — another ridiculous initiative aimed at legitimizing the military junta’s arbitrary rule and spreading the blame for its failures. (The Arabist has a good wrapup of various coverage; but I think his own view that this is the last gasp of military rule is way too optimistic.) The whole thing should backfire against SCAF: as though Egyptian liberals or their bilingual Facebook friends didn’t read The Guardian! But it might not. Nicholas Kristof just wrote an amazingly dumb dinner story. Here is mine. We had dinner today with my lovely friends whom I’ve known for a decade: they are both journalists, with two kids, an apartment full of books, and very liberal views (Arab liberal = favoring liberal democracy, i.e. elected civilian rule with constitutional protection for minorities; they’re also lefty and pointedly secular). Their younger child was born seven days before January 25 but, to the extent possible given two working parents and a newborn, they have been quite active in the revolution. The mom and kids had to go away to her parents’ house in another city during the week their street was flooded with noxious tear gas. 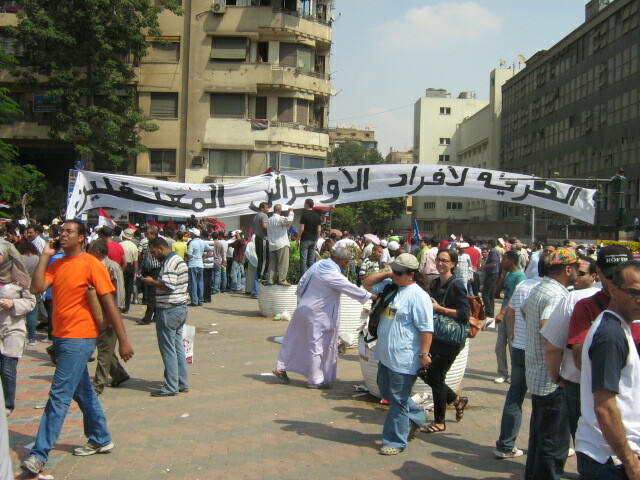 In short, they loathe SCAF with every fiber of their being.Ditto for the Brotherhood: when two polite MB canvassers visited their apartment building in October giving out Eid gifts and leaflets and asking where people would pray the Eid prayer, my equally polite friend not only refused their gift but told them he was not planning to pray. Imagine yourself now in these people’s position. The specter of illiberal democracy is stalking the region. From all sides one hears the words “Turkish model”: for Brotherhood supporters it still means (despite the disenchantment with Erdogan that Piotr Zalewski analyzes here) “moderate, non-corrupt Islamists boost economy and enhance global stature”; but for liberals it now means “the military as guarantor of democracy.” The problem is the transitional process SCAF has designed. But the ironic result is that some liberals may be tacitly turning to the junta for help. Me: So [the SCAF general] claimed the elections didn’t represent the population? That’s ridiculous. My friend: No it isn’t. Me: But they’re free elections. Isn’t that SCAF’s claim too? 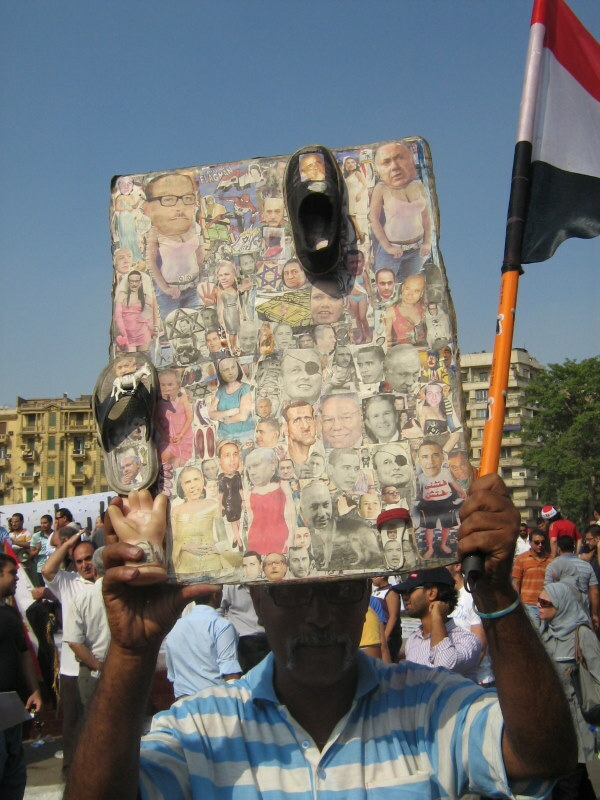 Him: But a constitution is not for one five-year electoral cycle; it’s supposed to be forever. It’s the fundamental law that constitutes the political system and decides how the other laws are made. For one parliament elected at one point in time to be allowed to write the constitution would not be fair. Me: Why not? Aren’t you doing the classic liberal thing, calling for elections and then rejecting the results? Me: You are. If the parliament accurately represents the current views of Egyptian society, which I think we agree it (unfortunately) will, why shouldn’t it be allowed to decide what the political system looks like? Him: What about protection of minorities? Him: What if the Islamist parliament appoints a constitution-drafting committee that throws out established principles of human rights? 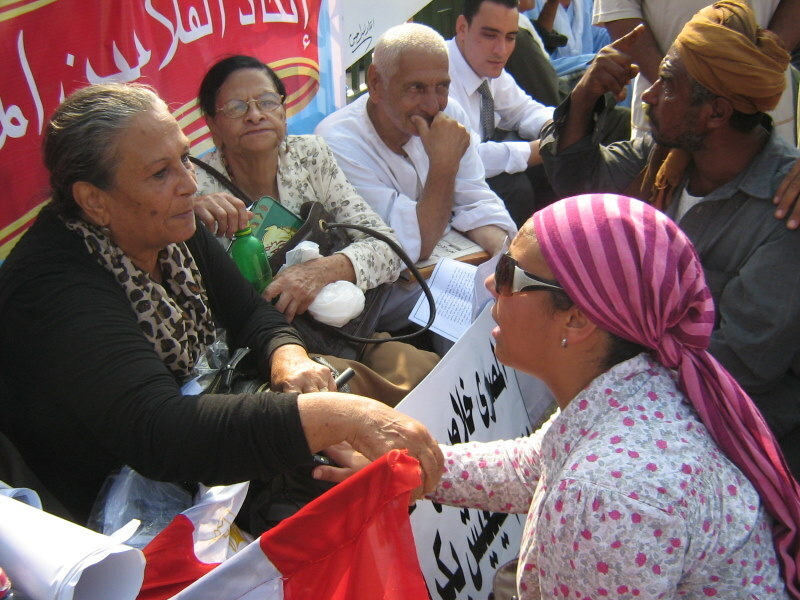 Or backs away from international rights accords that Egypt has signed? What if they only recognize three possible religions — Islam, Christianity, and Judaism — without making room for people who are Bahai or something else or atheist? Me: Hmm. So just like in the Mubarak days, secular liberals are tolerating the military dictatorship as a bulwark against organized popular Islamism. Me: You are running to SCAF for help. Me: I know, it’s messed up. But constitutions aren’t forever. They can be amended; they contain procedures for amendment. When the US Constitution was adopted, women couldn’t vote and a black person was only 3/5 of a person. Him: You can’t have parliament changing the constitution every five years. If people like me managed to elect a Socialist parliament one time, I wouldn’t want them to be able to rewrite the constitution either. Me: No, you’re right. Plus, constitutional amendments aren’t easy. I just kind of glossed over the whole Civil War thing that those U.S. amendments required. Him: You see what I mean? I do. How the hell to have a democracy where 60 years of misrule (or should we count the British and make it 130?) has fried the demos? It’s hard enough everywhere else. Me: So who would you say should represent Egyptian society for the purpose of writing the constitution? Him: There are other groups. Syndicates, for instance. The syndicate of doctors, lawyers, engineers. The writers’ union, the syndicate of journalists. (Ah, the journalists.) Give each of those groups a representative. And then give the parties in parliament representatives proportional to their seats, comprising maybe half or two-thirds of the constitutional committee. I see the appeal of having some intellectuals involved. But — writers and artists appointed by generals, really? Plus, isn’t that pretty much what the SCAF guy said? 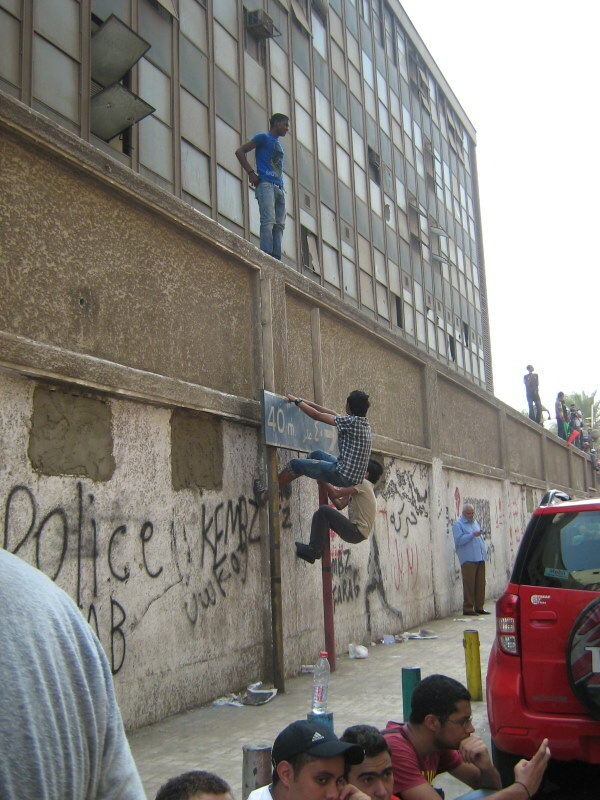 So we come back to the scenario of SCAF-MB checks and balances. If the MB can actually win the power to see the military’s budget, and SCAF in turn can help the MB tame rather than appease the probable crazy social-conservative agenda of its Salafi co-parliamentarians (whether they end up being coalition partners or yappy opposition), then the country certainly will not move forward; checks and balances are designed for gridlock. But at least it may get a bit of breathing room and stable-cleaning. That is the only remotely optimistic medium-term outcome I can see. People in the women’s line at a school in Zamalek had been waiting up to five hours, since 7:30 am, when I arrived. They seemed happy about the process; the weather was beautiful; things were relatively well organized; some clever people had even brought folding chairs and/or sandwiches. It was unclear how the would-be voters stretched for six blocks along July 26 street, then around the corner and another several blocks on the parallel street, would all get in before the 7pm closing time. But when I passed by later the line had shortened a lot, and anyway the polls are open tomorrow as well. The polling place itself was secured by the same type of army guys I’d seen at Maspero last week (olive uniforms, helmets, etc), but all the security and organization I saw outside was taken care of by the young men (and I saw one woman) of the Popular Committees, the (mostly) unarmed neighborhood watch groups spontaneously organized when police were withdrawn from the streets in late January. They wore no uniforms – in some cases not even a laminated nametag – but people respected them and followed their instructions. As in: “I’m sorry, ma’am, this line is only for those who are over 60 or pregnant. You’ll have to go down that way, around the corner, second left.” And the person would immediately go. Bottom line is that at least today there’s a free choice, even if its ultimate impact will soon be canceled by gridlock, bickering, continuing dictatorship and dispossession. At least none of the candidates on the election posters is wearing sunglasses. 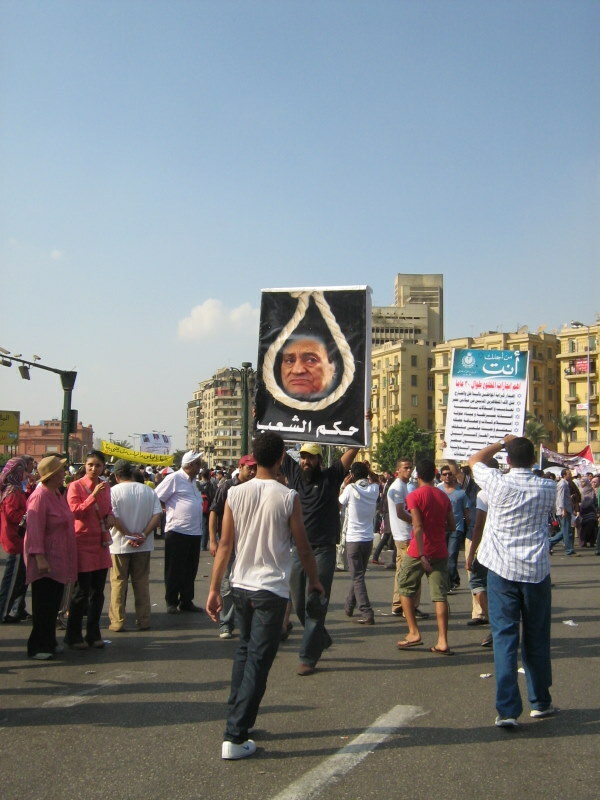 A year ago, instead of all those faces of folks who have decided to run for Parliament (some of them quite ordinary people), the banners and posters would have some variation of “Yes, Mubarak!” Not a lot to be excited about, but people are doing their best. Going out now just to look around a bit. 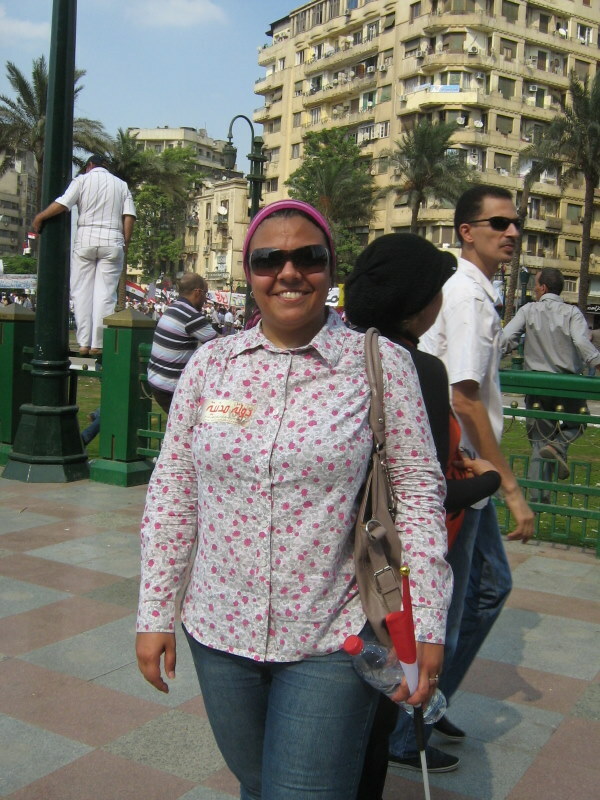 An employee at the Dutch Institute Library in Zamalek says her family in the Hussein neighborhood (their voting place is the Wikalat El Ghoury, where the whirling dervishes perform) are reporting a lot of crowding at the polls, especially in the women’s line. She finds this a very good sign but jokes (it’s 10am here): “The men are still sleeping!” There is a 500-pound fine (nearly $100 dollars, or 80% of the monthly salary of a low-level state bureaucrat) for not voting, so the turnout may be higher than the political situation would otherwise warrant. It seems that people considering a boycott have decided against it – a smart move, I believe. It is impossible to tell right now how high or low the stakes might be. You can read pieces in the Times etc and live coverage in a few places (notably at The Arabist and Al-Masry Al-Youm. Meanwhile, here are a few misc photos of the election campaign posters. Note that each candidate and party has a “symbol” on the ballot, presumably for less-literate voters (though with hundreds of individual candidates plus party lists to choose from (and some are listed as “farmers” or “workers” to fill those quotas) even the more literate could use some help. Some of the symbols are funny. Heliopolis candidate (polisci professor and well-publicized partner of a film star) Amr Hamzawy has an engagement ring. Others I’ve seen: screwdriver; fishing rod; suitcase (seems like a bad message to send, no? ), CD, sports car, hoe, oversized apple. 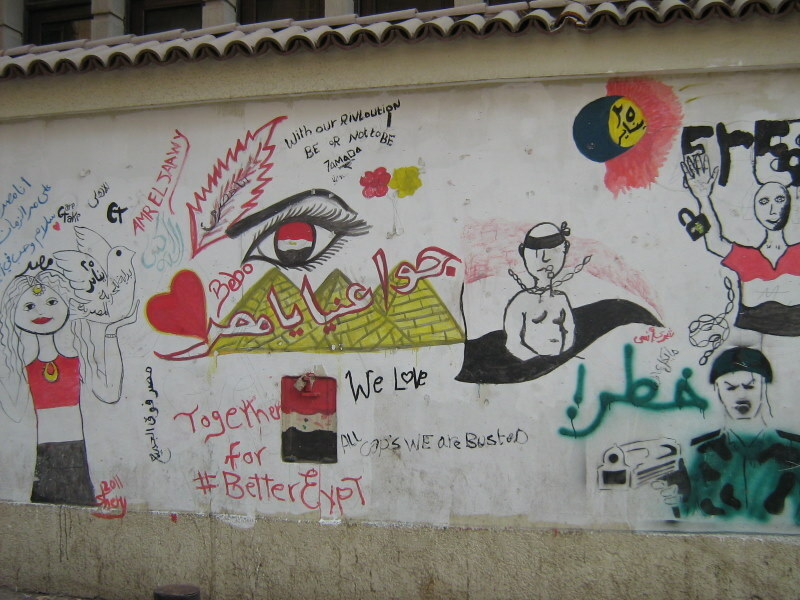 A blonde candidate with a charming sunflower got her Zamalek posters defaced by someone who scribbled “filuul” (old regime remnant) all over them. So it goes. Of the posters we’ve seen, only Gamila Ismail’s lack the little symbol; presumably she is not courting illiterate voters. 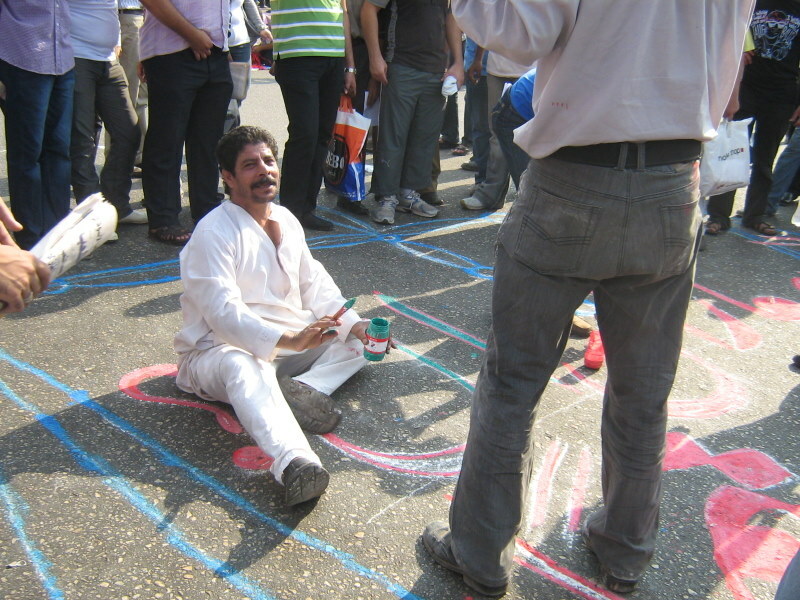 Protesters slip easily into what the Egyptian Gazette called “the Friday routine” of demonstrating. The Central Security forces occupying the “bowl” at the center of the square and the military vehicles in the surrounding streets had disappeared at midnight on Thursday; the only sign of government presence were some ambulances. 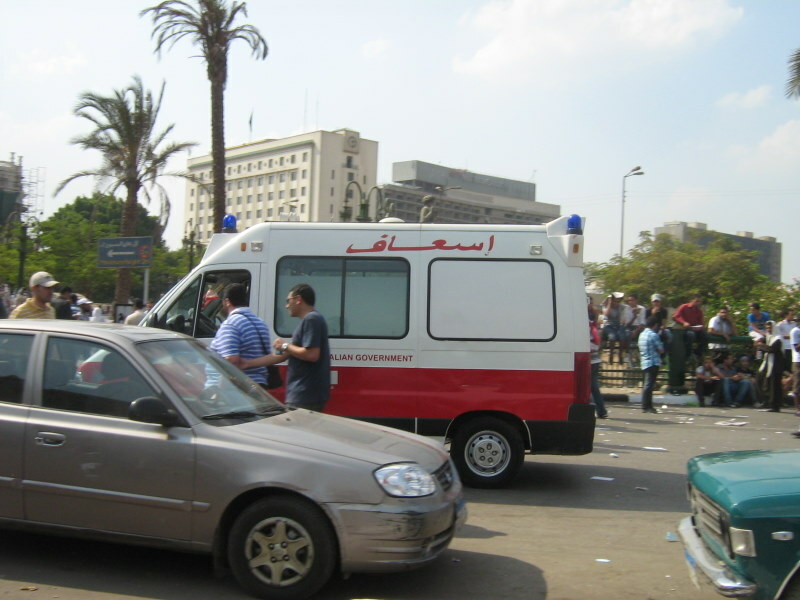 Since it has been reported (or at least rumored) that Egyptian security forces have used ambulances to hide weapons to give to thugs to use against the demonstrators, this did not arouse a lot of confidence. But when I was there no one was nervous either. The atmosphere was like a block party, with friends greeting each other happily (many of these friendships seem to have begun in Tahrir in the first place), vendors selling water and snacks as well as all sorts of souvenirs, and people of different ages and social classes (notably the better-dressed “civil state” demonstrators and the rowdier Ahly crew) greeting each other with great courtesy: Munawwareen! Some slogans against America and Israel, notably rare (though not absent) in the original Jan-Feb protests, have begun to surface. Check out the intricate collage this guy made! 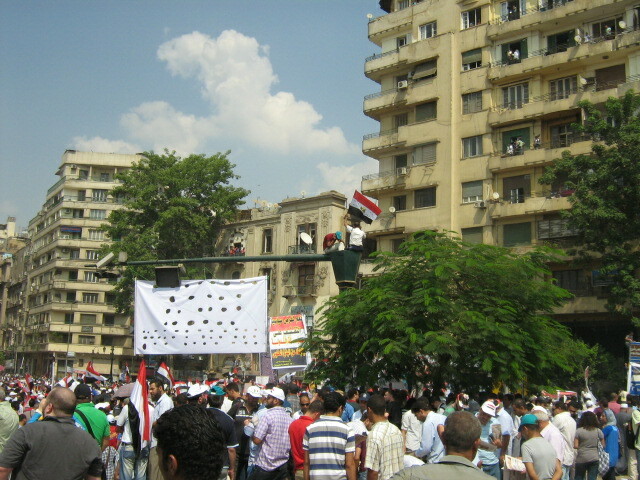 Some photos from Tahrir Square today. I was there in the early afternoon shortly after Friday prayers, long before the unpleasantness with the Israeli embassy that happened later. 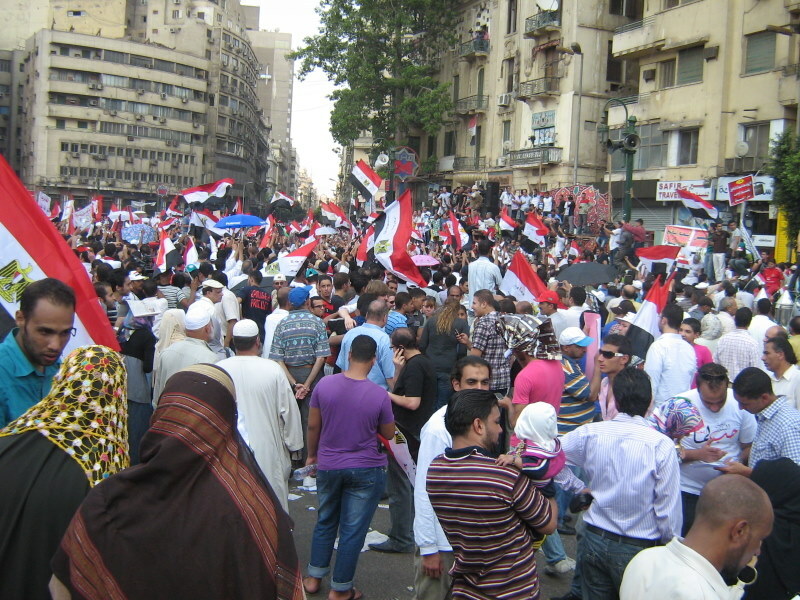 The group that was the loudest and best organized were the Ahly Ultras, supporters of Al-Ahly soccer club whose `asabiyya (group loyalty, ibn Khaldun’s term) and personal courage, not to say plain thuggery, was essential in winning and holding Tahrir Square during the 18 days. Their big sign appealed for the release of some Ahly supporters detained by the police after scuffles around a match on Tuesday. 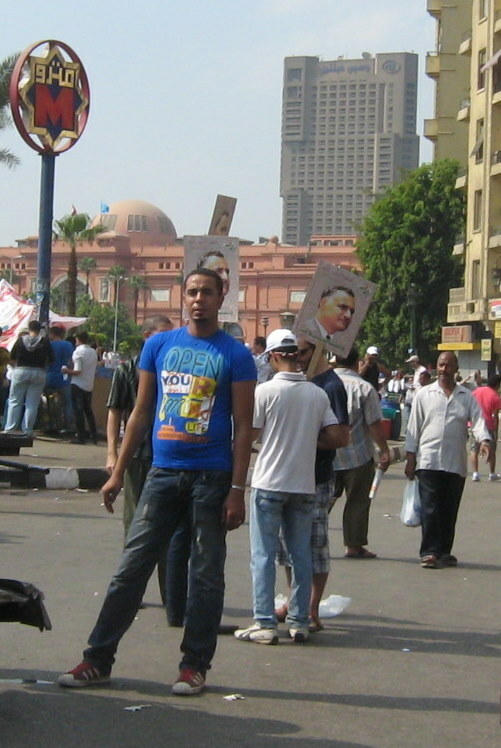 Another group of young demonstrators, closer to the main stage (there was only one today) carried pictures of Gamal Abdel Nasser! This was billed as the rally to “Correct the Course” of the revolution, but there was a feeling of confusion about it, at least at the beginning, and even nostalgia for earlier protests when the goal was completely clear. Some people wanted to talk about election districts or judiciary independence or an end to military trials for civilians, others about whether the state should be religious or “civil” (madani – don’t ever say ‘almani, secular, or they’ll think you mean laique like France! ), and others wanted to talk about Israel, a few guys even marching with hammers and chanting “The people/ want/ the demolition of the wall!” (Meaning the protective wall recently built around the Israeli embassy.) There was much disagreement over whether this was relevant to the revolution’s goals at this point or not. But the abundance, variety, and occasional subtlety of political opinions is a joy to see. People (not just intellectuals) read newspapers, listen to the radio, think, take an active interest in politics. I still think what happened in February was technically a military coup, the SCAF deciding that it would best serve their interests to put Mubarak on a helicopter. If there has been a real revolution, it is happening in people’s minds, their souls, their voices. Perhaps in a few years, a couple of decades, it will translate to a better system of government. I didn’t stick around to see what this man was painting, but there was a heated (occasionally humorous) argument about it.